New Releases and Special Gifts are waiting for you. Join us and discover the new Sway's Creations. Take part in the Sway's Creations Photo Contest. 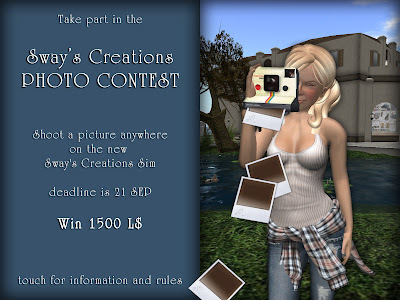 and their photos will be shown at the Sway's Creations Update Blog and the Sway's Creations Sim.